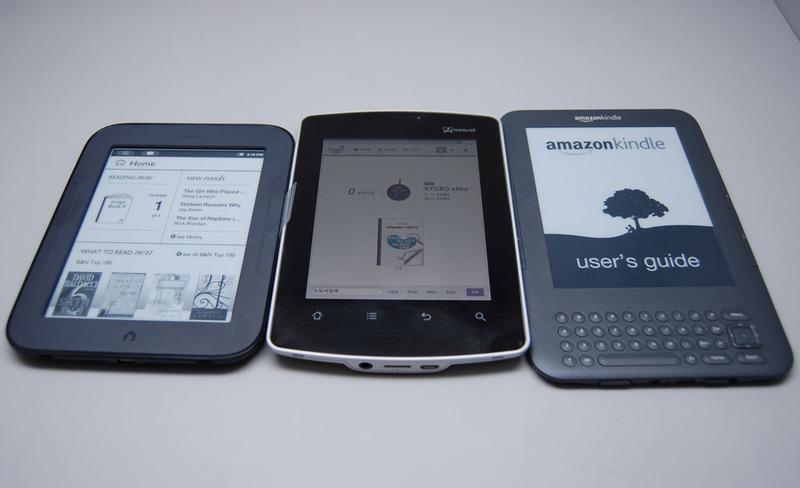 This post is the (somewhat delayed) second part of my Kyobo Mirasol eReader Review. I wanted to cover the screen tech separately because I thought the device it was built into deserved its own pummeling. I've been following this screen tech for a couple years now. I first heard of it just after CES 2010, and I saw it for the first time a couple months later. Ever since I saw it, I've lusted after Mirasol (for the obvious reasons). It's a low-power color alternative to E-ink which was supposed to offer video abilities and can be read in sunlight. But the screen is not there yet. As I showed in the other post, it's not all that much more energy efficient when compared to LCDs (at least the Kyobo eReader isn't). And while this screen is daylight visible, the color quality is disappointing. Have you seen the old demo videos posted to Youtube or possibly glimpses one of the demo units on display at a trade show? The production model looks very little like the prototypes. I wonder if the reason for the difference is how the screens were made, or possibly the fact that I can finally interact with the screen rather than just watch a demo video. On a related note, guess who made the demo screens? Prime View International, that's who. Yes, back before they bought E-ink, PVI was E-ink's main manufacturing partner but they also did small production runs for just about everyone, including LiquaVista, E-ink, Sipix, and Mirasol. 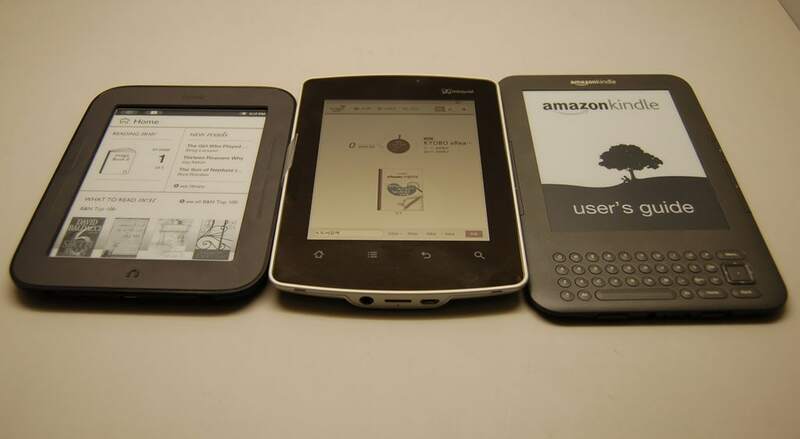 The dominant color of the screen is silver, not white like an E-ink screen. The color quality of the screen is best described as washed out when the frontlight is on, and when it's off the screen resembles the monochrome screen from an old PalmPilot (with a few hints of color added). Yes, it's visible outside, and that does improve the color quality. But it still looks washed out. In fact, I'm not sure that this screen really offers better color than a color E-ink screen. I'm going to have to put it side by side at CES to confirm, but I have the feeling that the color E-ink screen will only be marginally worse than Mirasol. And then there's the viewing angle. It's difficult to catch this on camera, but the Mirasol screen has a narrow viewing angle (unlike E-ink screens or good quality LCD screens). I know it's not fair to compare Mirasol and E-ink viewing angles, but the Mirasol screen is narrow even when compared to even LCD screens. One of the Kyobo commercial for this device shows a family clustered around the small screen. Unfortunately, that scene is just not possible. If you turn the screen more than about 10 degrees in any direction, the colors shift drastically. It's still readable, but most subtle details are lost. I would go so far as to say that the viewing angle on this screen is actually narrower than some cheap LCD screens in my collection. I'm really disappointed, and TBH that's why I held off this part of the review for several days. I wanted to take time to really think about the screen and confirm my impressions. 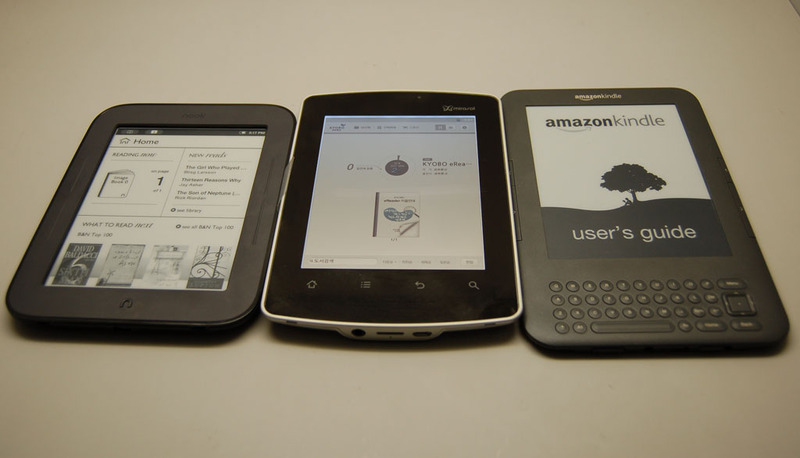 I had been unhappy with the Kyobo eReader's performance as an ebook reader, and I didn't want my dissatisfaction with one to bleed over into the other. P.S. All photo credits belong to Mersfire, who is a much better photographer than me. Check out the review post for a gallery of photos. I wonder if there are Marisol’s with good viewing angles and cheaper ones with bad ones, just like with LCD’s. If not, then you have just cured me of wasting anymore time in waiting for the Marisol tech. Good viewing angles in a tablet.. (heck, any LCD for me.) is a must! Have you ever considered the possibility that the Mirasol screen tech might evolve to have much better viewing angles in the future??? @Peter Olsen: Nope, the viewing angle is limited by the laws of optics. The Mirasol screen uses an Interferometric Modulator to generate the colours… but this only works if the two elements of the modulator are aligned. Maybe the marketeers at Qualcomm can exploid it as a “privacy screen”: only the owner of the device can see what’s on the screen properly. Also, the Mirasol technology has been under development for over one and a half decades! The company that has started the development is Iridigm Display Corporation, and was founded in 1994 my Mr. Mark Miles. Qualcomm acquired Iridigm in 2004. @Nate: maybe you could remove the cover glass and the frontlight to see the real performance of the Mirasol screen. All the extra reflective surfaces of the glass and the frontlight have a negative effect on the colour performance of the screen. Very disappointing, especially the colors and the contrast. If it’s not that much better than color e-ink, there’s not much of a point. Hopefully future versions will be better. IIRC Fujitsu had some higher-saturation screens using a different technology, but I don’t think those have been commercialized yet. The Fujitsu FLEPia screens did hit the market in Japan. I wonder who was the genius who decided to launch this splendid Dead On Arrival. The true question is if Mirasol has a future or not. I guess that it is going to be improved, since Qualcomm has invented a couple of billions in a dedicated factory. But if actual experience is SO bad, I wouldn’t bet seriously for it. Something doesn’t add up. Look at http://www.youtube.com/watch?v=MyoKbHx1nAs or ANY of the demos at trade shows. The colours are pretty good even at fairly extreme angles. So, how did they fake it and manage to take everyone in, or did they ditch the original in order to give it a front-light? Even though the show models were demos the screens appeared to function decently. What was the point in the efficiency claims if they proved to be untrue? Why would they deliberately damage their own reputation? Thanks for the review. Looks like being the Asus transformer Prime for me for the near future. This is a question that I want answered, too. I’m going to bring my unit to CES with me so i can compare it against the demo units. Nate, I bet you the demos don’t have any additional layers on the mirasol screen. The Kyobo has at least two: the frontlight and the coverglass. Basic optics tells you that each layer will loose 5% of the reflected light, especially when the cover glass has such a glossy finish as the Kyobo reader has. And of course, they will have the demos illuminated very brightly in the booth. I remember in some of the youtube movies, the presenter was really squeezing his/her eyes. Some of the old videos show the Mirasol Demo model outside and it looked fine there. I take your point about the glass, but would it have had that dramatic effect on viewing angle? In the middle of the Kyobo demo at http://www.qualcomm.com/ces the ereader is rotated. There is a bad case of reflection during the rotation but the image and colours appear to be clear at a quite extreme angle. 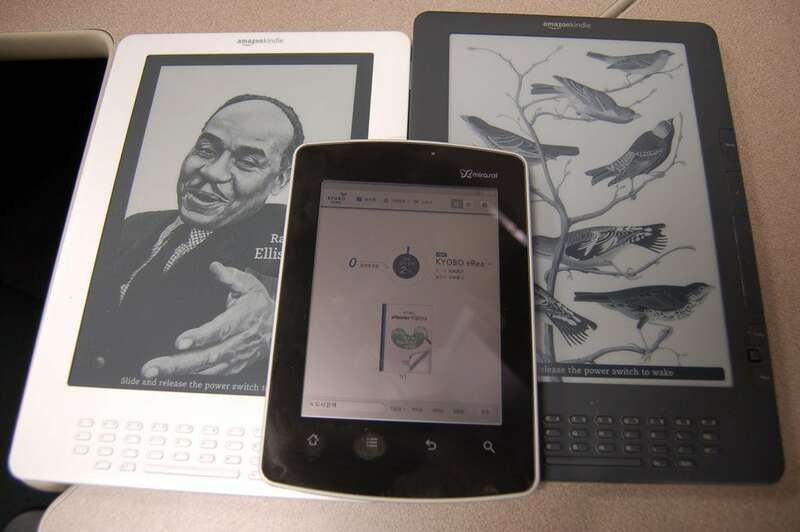 Have Qualcomm doctored the video or is the production Kyobo ereader just far worse than the prototype? Or did you get a bad sample? Briefly speaking, I think Qualcomm was deceived by it’s MEMs department. I think it cannot be product. 2 reason, first, the color performance and relibility are poor. MEMs structure as display? I don’t think it’s good idea. The air gap will decline with time goes by. And too many issue in relibility. Second, the cost is high and yield is low. The final yield as I know is about 20-30%. Nice to finally see a honest review of this. I finally saw one and can’t figure out who in their right minds would want one. Under normal indoor light, the contrast was a blend of black letters on a copper colored plate. It needed to have the LED light brightened to full in order for the copper color to more whitish. Either way, it just wasn’t comfortable and was a strain on the eyes. Colors were really washed out. I noticed whenever they demoed this product, they made sure it was under extremely bright and full spectrum lights.